Chances are, unless you have recently moved into a house where every room is still builder beige.. you probably have multiple (often similar) colors of paint to keep track of. The ability to remember which color you used where along with the brand and finish can be difficult. 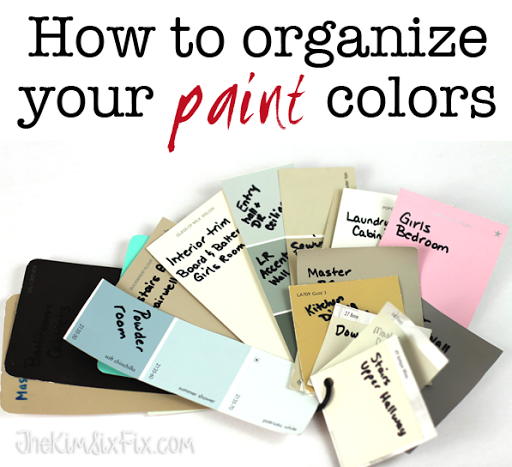 So today I’m sharing a quick tip on how to keep track of all the different paint colors you use in your home. This method has a lot of benefits over the “keep the cans in the basement and try to remember” technique that most of us have used. Having all your colors organized and labeled makes it easy to find the correct color when touch ups or repainting is required. You also can see the colors used in your entire home in a glance which make its so much easier to select new colors yet still maintain continuity in your overall color scheme. Not to mention shopping for fabrics and furnishings! I know a lot people probably do this. Writing the name of the room where where you actually used the paint directly on the paint can is a good way to quickly label and sort all those cans that are stored in our basements and attics. It makes it easy to know what paint goes with what room.. plus if you have the label on the can which includes the color formula you can always get additional paint.. right? Isn't that enough? What happens if you have a paint collection like mine and you are looking for that one specific color? You have to dig through all the cans and read all the labels hunting for the right can. And even worse what if your sticker goes missing or become illegible? You may have whatever paint is left in the can but you have no idea what it is or how you can get more. When buying paint always pick up the paint chip that goes with it. This will not only tell you which COLOR you are using, it also tells you the BRAND and often the formula number. I organize mine by punching a hole in each chip and putting onto a hinged binding ring. You also could store them in a binder or ziplock bag, but I like having my own little "swatch book." This is just like labeling the paint cans itself, but it is PORTABLE. You can take your entire color collection with you when shopping for fabrics, furniture, rugs. Not only in the room you are shopping for, but also in the rooms next to it. I also am sure to include my TRIM and CEILING COLORS and any cabinetry or other painted features. This has been a life saver on more than one occasion. The times I needed a touch up pint when there was none in the garage.. or when they stopped making the Martha Stewart line of paints and I needed the formula and color number to finish a room. Plus now anytime I am buying something I need to coordinate with my paint color, I just throw my ring full of paint chips into my purse and I have everything I need in one easy to visualize group, no matter which brand or color. So start collecting your paint chips when you buy new paint (or look for the swatches for the paint colors you are already using.) You'll be glad you did!